Hi Jaques. possible Copyright with the Drum and flag Name on the pics but replaced the with the D&F Video Review. Quite a nice looking set. I could probably use some Prussian mounted staff officers, so far I only have Blucher, Gneisenau and Bulow. The Blucher figure looks quite nice too but I don't know if I want to replace the Italeri one I already have. Lovely figures! Thanks for sharing! According to PSR the figures are 28mm (2.01m) which make them completely useless in this 1/72 hobby. Whilst the poses of the generals look wonderful I personally am not so keen on the horses. Lots of galloping and not enough standing and trotting. Also, whilst providing two versions of what looks like Blucher is fine, I can not understand why you would have a duplicate. Far better to have more of the other officers. If the size is 28mm, similar to the Itallieri guys then this, unfortunately us a missed opportunity. The horse poses are awful for command figures, most are charging, completely out of sync with the generals, which are mostly still. The reason was that Waterloo 1815 was aiming at saving money here, and used the same horses sculpted for their Prussian Hussars. 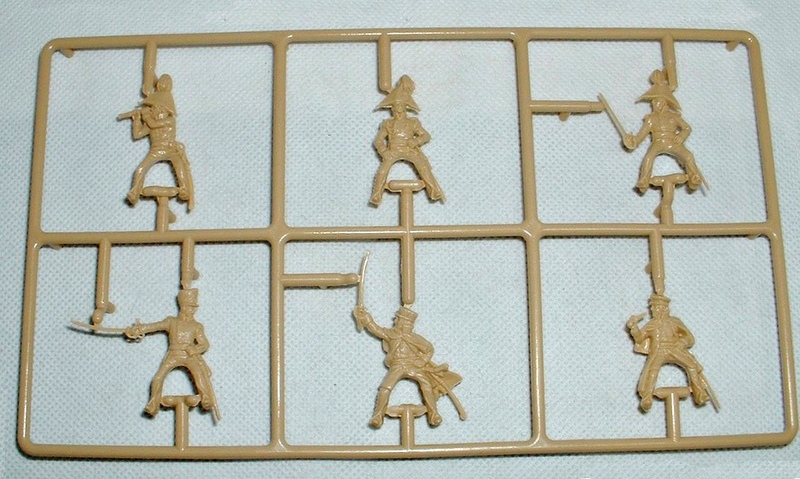 Now, those hussars are listed on PSR as 25mm tall, I wonder if the models here on the command set are indeed larger. 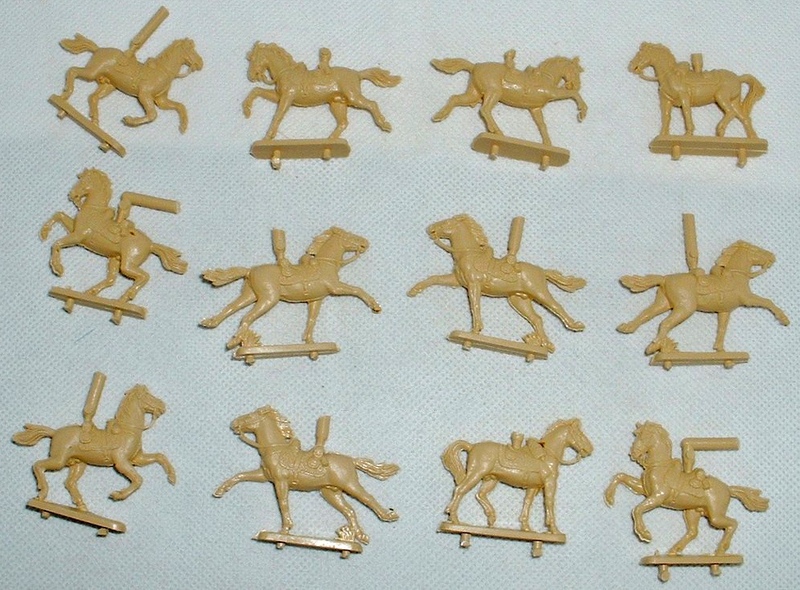 We would assume the horses here use the same mould as the hussars (which seems to be indeed the case, as they come in the box here out of the sprue), and they'd look silly with riders 28mm tall. I guess I'll have to buy this set and see for myself, unless someone do that before and is kind enough to post some comparison pics with other 1/72 figures. It'll be a real shame if those are indeed too tall, I was looking forward to this set, and even had made peace with the horses poses, thinking I could exchange the charging ones here with the resting ones on the hussars' boxes, so the commanders would have only standing horses, and the hussars only charging ones (it also doesn't make any sense that there are a couple horses standing still on the hussars' set, accompanning the rest of the models all with charging horses). If you asked me the horses looks like the old Italeri French cavalry horses. And it seems to me that they are not in the right size for the riders. Really a pitty! The horses are not in the same photo as the figures so i would hope they are a bit bigger than they look . From Ruperts video, measured from the sole of the feet to the brim of the hat, just above the eyes, the officer in bicorn is 27-28mm and Blucher is 25mm . That's slightly larger than the Italeri Wellington and Blucher I already have so they are BIG figures. 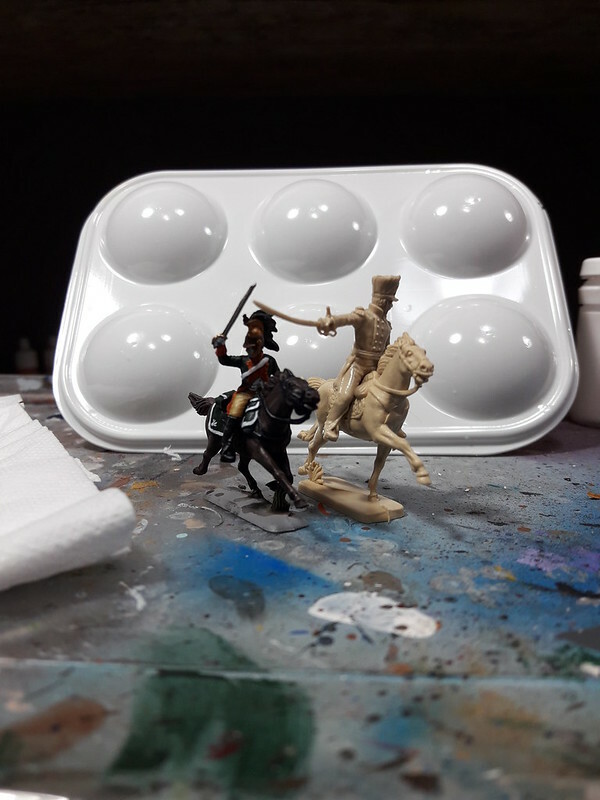 I don't mind Generals that will be on individual bases being a bit bigger, they are larger than life characters but it depends what they look like on the horses. Just got a set of these guys. I was already expecting them to be big, given the comments I've seen around, but I expected them to be Italeri big. This is simply not 1/72 scale. It's actually pretty close to my 28mm scifi models. I'm usually very permissive regarding the size of the minis, but I must say that, this time, the difference is too significative. Not for me. Too bad. The Italeri figure is from one of the normal sized Italeri sets though, it's not one of the Italeri giants. I was hoping these figures would not be much bigger than Italeri's Wellington and Blucher; and I really was prepared to accept staff figures being a bit oversize but PSR has a picture of one of these on it's comparison page now (fifth picture up from the bottom) and it looks huge compared to the staff officer from Italeri's British and Prussian Staff set. 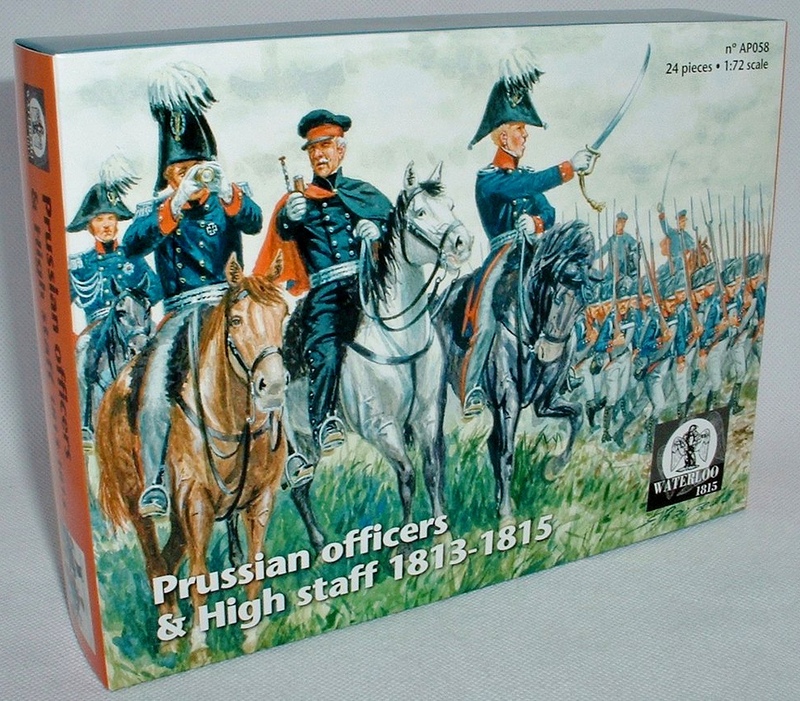 Looks like these figures might match with the GIANT Italeri Prussian infantry which I didn't buy because they were too big.This really is a missed opportunity because it was a very good idea for a set. I might buy some more HaT mounted officers instead. Compatability between manufacturers, whilst ignoring the System International of measurements, might not be on a producers mind when creating their product. This I can understand to a degree. However, when they are incompatable with their own offerings it does make you wonder what they are thinking. Is this a problem of inexperience with new technology? 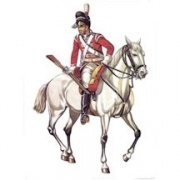 Hat managed to produce 28mm figures in their Peninsular Cavalry when they intended 1.72 and their latest offerings in infantry have garnered complaints of undersize.